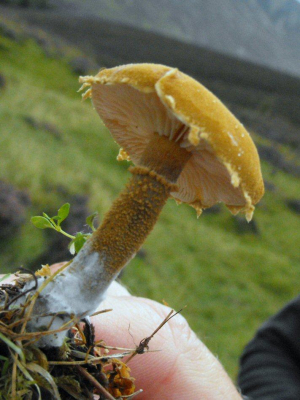 Observation - Earthy Powdercap - UK and Ireland. Description: Orangy-yellow cap with scraggy edge to cap. Gills yellowish & crowded. Granular appearance on stem and cap. Orangy-yellow cap with scraggy edge to cap. Gills yellowish & crowded. Granular appearance on stem and cap.